Iain’s grandfather was a fearless Scottish war hero, whose painting hangs on the wall of Edinburgh Castle. Iain was a shy teen growing up in Gloucestershire with two goats, 27 dogs and awkward hair. 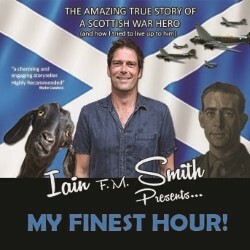 This funny and heartwarming story reveals how Iain struggled to live up to his prestigious family history and faced his very own enemy on the beach. 'Very funny... a charming and engaging storyteller. Highly recommended.' (Blythe Crawford).